We are specialised in sustainable construction. Daxner & Merl offer modular consulting services for builders and architects as well as consulting services in the integral planning process for building certification of large-scale construction projects. With extensive experience in the field of sustainable construction, we are actively involved in large-scale projects. At the same time, we offer tailored solutions for praticular requirements as there is not always a need for a full certification process. Sustainable construction is based on life cycle thinking from project development to the end of life. Integral planning processes provide high quality results by considering ecological, economic as well as social aspects. 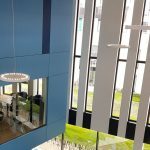 You are ready to implement state of the art solutions, tap the potential of your organisation and implement the best strategy for sustainable construction? Please contact us. 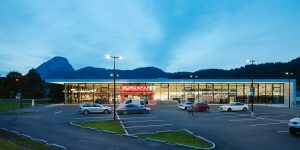 The Austrian retail chain SPAR counts on sustainability when it comes to supermarket design. 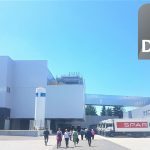 Every new-built SPAR supermarket meets the sustainability criteria of the DGNB certificate. 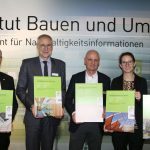 With the help of serial certification – Serienzertifizierung – SPAR represents a pioneer when it comes to sustainability. Certification in series helps to achieve sustainability standards with very efficient project management while reaching sustainability criteria in all dimensions. 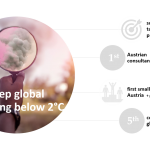 Selected flagship-stores – Klimaschutz-Supermärkte – are even further optimised with regard to sustainability criteria. These pioneer supermarkets meet the highest requirements and are thus awarded the DGNB platinum certification.